While the rest of you were crying into your cruelty-free glasses of vegan pond-water over the repeal of net neutrality, humanitarian and activist Rob Bliss was restoring freedom to American roads. Bliss, like Ajit Pai, isn’t a professional engineer or expert on the flow of traffic, but that didn’t stop either of them from “fixing” problems only they could see. Before he came along, people traveling the streets of Washington weren’t free to vote with their wallets and choose a fast lane. Everyone was stuck sharing all the “bandwidth” that was available. Unfortunately, the police don’t seem to understand how America works. When a person fixes a problem they deserve to be paid richly for doing so. 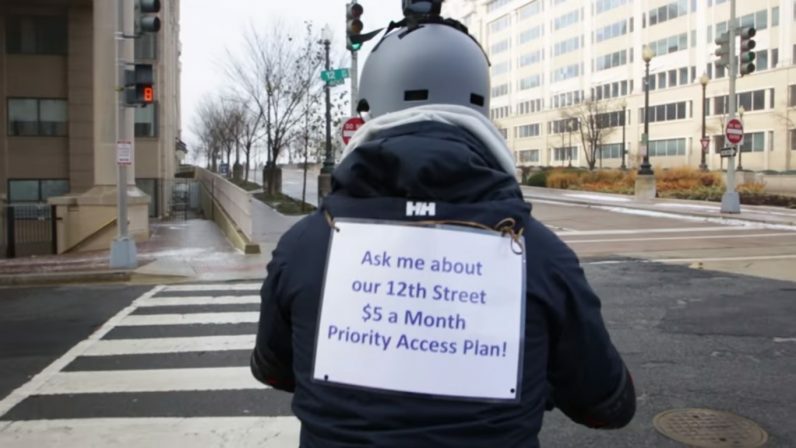 Bliss may have been the only person who had a problem with the commuters of D.C. not depositing money directly in his pockets for the privilege of driving on 12th street, but this isn’t about fairness or what the majority wants. It’s about ‘Merica. The cops were amazing. I was pretty nervous throughout all of filming, almost got hit by a car a few times, or tackled by the police (note the helmet, knee, and elbow pads!) but I think D.C. police just has a lot of great training and also experience due to frequent interactions with nonviolent protestors. They were great and their patience levels were enormous. When former Verizon lawyer and current FCC chairman Ajit Pai last year repealed net neutrality he required no mandate from the American people. In fact, US citizens were overwhelmingly in favor of keeping net neutrality. But Pai, and hundreds of GOP politicians, accepted large sums of money from ISP lobbies in lieu of public support for their actions. Bliss, who you might remember as the good Samaritan who used Amazon Prime Now to send care packages and warm clothes to freezing homeless people, wanted to prove a point. No single person should be given authority to decide what’s best for consumers. Rob Bliss shouldn’t have the power to disrupt traffic down in our nation’s capitol for his own financial gain. And former Verizon laywer Ajit Pai shouldn’t be allowed to do the exact same thing with the internet.